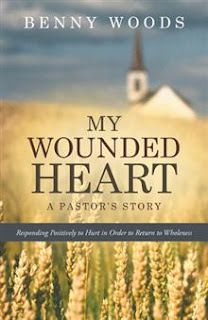 Having known Dr Benny as my personal saint, counselor and pastor, I am honored that I was asked to write my first book review for his latest book My Wounded Heart. A Pastor's Story. This book is recommended reading for anyone who has been hurt. Ever. If you have gone through times in your life where you doubted God's plan for you, then you need to read what Pastor Benny has to say. The first thing that you'll notice when you start reading the book is the Dr Benny's spiritual foundations. Partly autobiographical, reading this book makes you realise how God allows His children, even the ones He chooses to do His work, to go through a process of spiritual refinement. By the time I was mid-way through the book, I was welling up with tears and having gone through something similar in my workplace many years ago, I could understand his hurt. And this is exactly what I needed to read to heal. My Wounded Heart. A Pastor's Story gives you a glimpse into the personal and professional trials and tribulations that Pastor Benny went through and is a handy guide for anyone who wants to heal. There are many things I liked about the book. I loved the easy imagery that he puts in our minds. As I kept turning the pages, I found myself traveling along with him, through the countryside, the roads and the cowboys, feeling the same hurt that he felt, the betrayal, angst and the depression. His style of writing is relatable and easy going. His methods simple and his advice enriching. 'My Wounded Heart. A Pastor's Story' is born out of years of experience living with and coming to terms with wounds that people can inflict on you, with practical advice on how to come out to the other side stronger than ever. I thoroughly enjoyed reading Pastor Benny's book and I am sure you will too.